Today is the 14 of February which means… It’s the day for lovers and partners and spouses and crushes. It’s the day we celebrate all that our significant others mean to us. We do so with flowers and cards and gifts and intimate meals for two. Melbourne’s restaurants, cafes, bars and event venues will be overflowing with couples, all wanting a table for two and a special night out. Surely there is no way anyone could make Valentines Day even more romantic? Well there is and plenty of people will do exactly that. I am talking, of course, about proposing to your significant other on the most romantic day on our calendar. 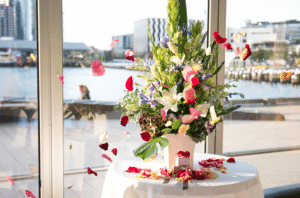 Hundreds of people across Melbourne will be slipping a ring into their partner’s bolognese, hiring sky writers or simply saying it with flowers and a card. 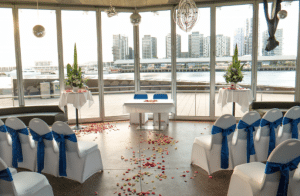 Whatever their modus operandi, there will be plenty of brave souls in event venues throughout Melbourne, on bended knee uttering that question which carries greater meaning than any other string of four words in the English language… ‘Will you marry me?’. With the hard part out of the way and (hopefully) a ‘yes!’ answer, it is time to celebrate! 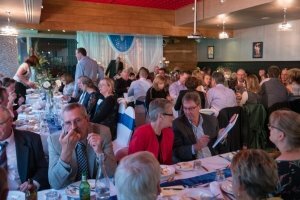 And there is no better way to celebrate than with an engagement party with all your friends and family at one of the city’s great event venues, Harbour Kitchen. We host all manner of events but, due to our location and unrivalled service standards, we have become synonymous with engagement parties and wedding receptions. After many years and many hundreds of unique and successful engagement parties, we know exactly what soon-to-be-wed couples need from their event venues. We are as devoted to making your special day perfect as you are to each other. If you proposed or were lucky enough to be proposed to this Valentines Day, the next step couldn’t be easier. 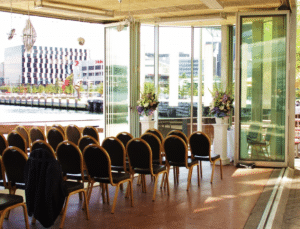 A fantastic engagement party at one of Melbourne’s premier event venues.